Location: Coldingham, Berwickshire, Scottish Borders, Scotland. Ownership / Access: Hall family. 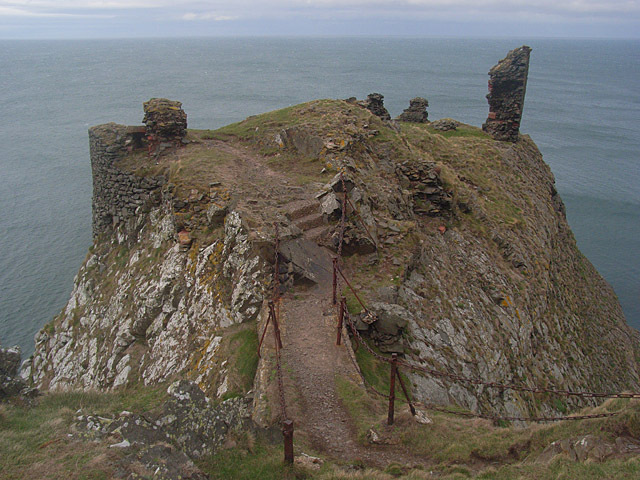 Notes: Fast Castle is the ruined remains of a coastal fortress in Berwickshire, south-east Scotland, in the Scottish Borders. It lies 4 miles (6.4 km) north west of the village of Coldingham, and just outside of the St Abb's Head National Nature Reserve, run by the National Trust for Scotland. The site is protected as a Scheduled Ancient Monument. "Fast Castle and its owners: some notes on their history" (PDF). Proceedings of the Society of Antiquaries of Scotland 55: 56�83.